Philadelphia Phillies center fielder Odubel Herrera (37) is congratulated after hitting a home run during the sixth inning of a game against the Milwaukee Brewers at Miller Park last July. Get ready for Throwback Thursdays. The Phillies will turn back the clock and wear their powder blue throwback uniforms on select Thursday home games this season. The team said on Tuesday that it will announce further details on the promotion at a later date. The uniforms were the Phillies' road jerseys during the 1970s and 1980s. 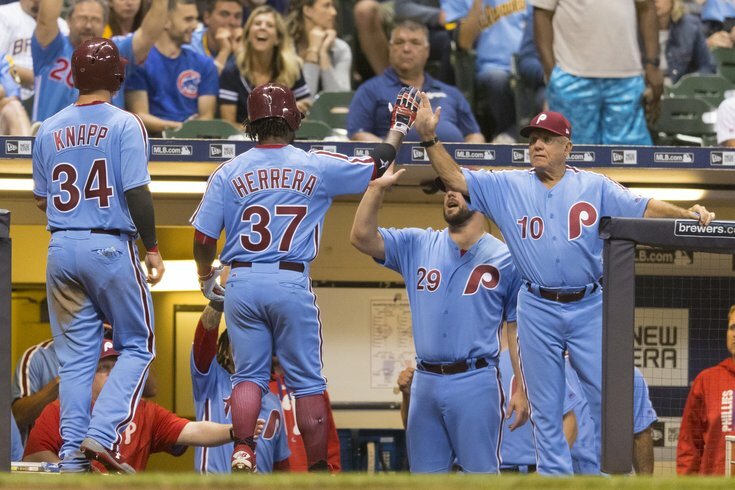 The Phillies wore the throwbacks on the road against the Milwaukee Brewers last July. A week earlier, they had also worn their old burgundy pinstripe jerseys in two games during their Turn Back the Clock weekend at Citizens Bank Park. Pitchers and catchers will report to Clearwater on Wednesday for Spring Training.